Yay! We finally finished the art studio, just in time for school. I really did my due diligence on planning for the space, and I tried to design something as cost effective as possible. I read many magazines and books featuring spaces where women create, and I took note. I noticed several things about artists in particular. For example, many of the artists use stools in their studios rather than chairs. I also noticed that of all the creative types, artists were by far the messiest, so the fact that I am very meticulous and neat makes me a bit more unique! I want to thank all of you for your input, too. Y'all did influence and encourage me during this process. I have also been inspired by many posts, and one of Gayle's posts @ The Vintage Farmhouse rocked my world. You can see the post here. 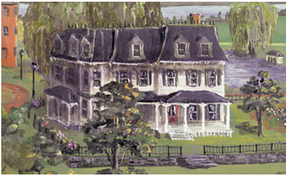 I like how the artist's home reflects her and her family. I found it charming, and I wanted to take some risks, too, but risks that reflect us. The space is very small, only 10' X 11'. 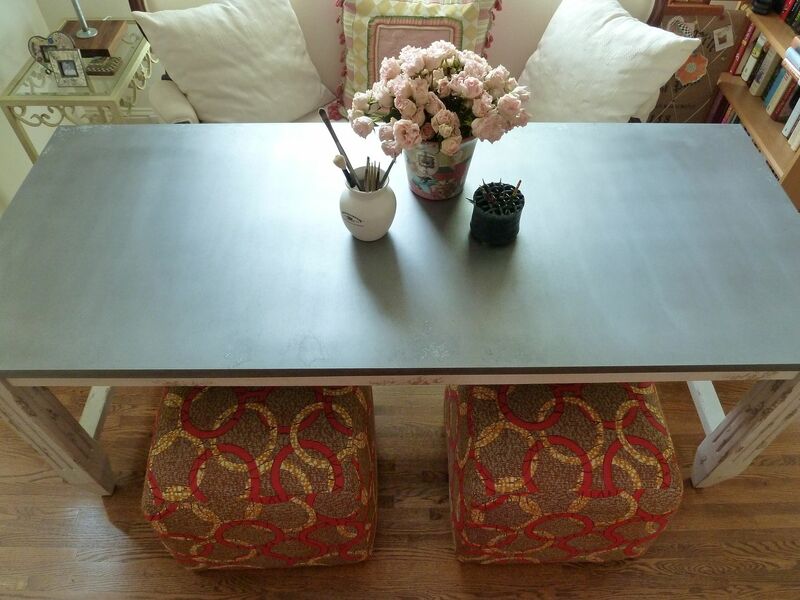 Our primary needs for the studio include: storage, a sturdy worktable, and seating. My daughter, Shelley, and I are very pleased with the outcome. Here are the photos from our new art studio. Mr. Art @ Home built this lamp from plumbing supplies and butcher block. A local store sells them for three hundred dollars. Mr. Art @ Home bought this Tiny Table for me as a surprise. I had to rethink some choices when he bought it for me! The top is made from an artist's palette. We are enjoying our space already! I will post more about the details of the studio in a few days. Oh Ricki, it is so lovely! You all did a beautiful job. 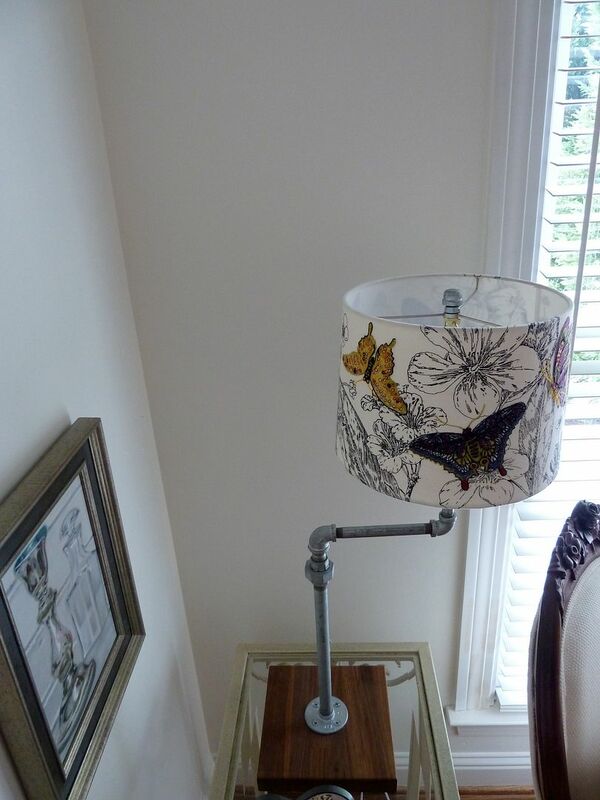 I love the lamp that Mr. Art @ Home made! It is so awesome! Also love the table he got you, so unique, just like you! I love, love, love the new rooms! The painting in process is stunning. Very happy for you and Shelley. I am soooooo happy for you!!! I think it is amazing!!! I can see why you and your daughter are so happy, and the Mr. is so awesome too!! I have to say that I am a messy artist. I am more of a paper artist, as you know, and there are scraps of paper, and glue, and gesso and and and everywhere!! I think it's awesome that you are so neat!! And your rose painting is already amazing! You are so talented!! Wishing you and your new space many blessings! Wow! This is really a stunning room. Your work table is great and keeping your art supplies in the armoire really keeps things neat. Mr. Art's lamp is fabulous and I really appreciate his taste in the gifts of art he gives you. Love the flower you are working on. Are you working with watercolors or acrylics? 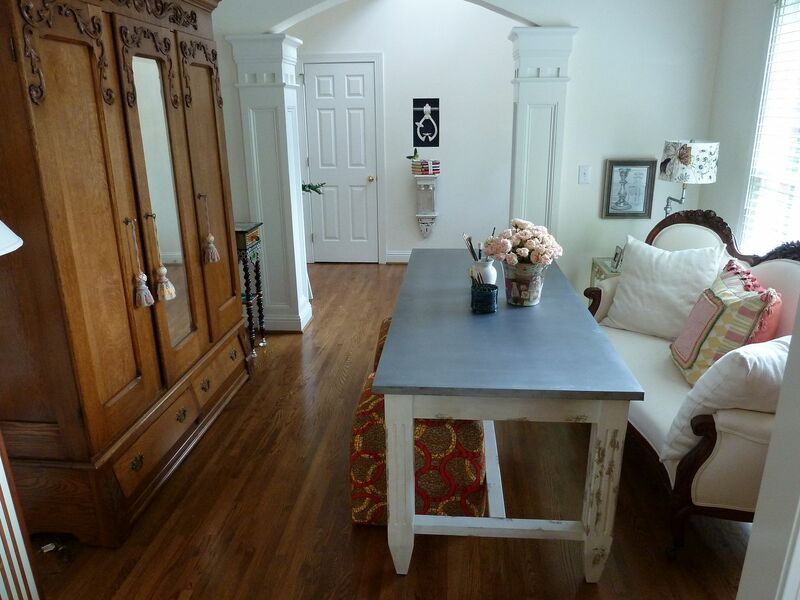 Looks so cozy and comfy, and that huge armoire is an amazing storage space for your craft/art supplies. It should help keep everything neat and organized!! You did a fabulous job! Girl it is so nice. I love the armoir. The scroll work on the armoir is stunning. Love the room. Will you be sitting on the sofa to paint or at the table? I didn't see a TV. I have to have a TV while I work on a project. I love your rose you are working on. Awesome art girl. Very nice! LOVE that sofa!! oh my gosh so fancy smancy for sure,, I sure hope you never ask to see where I paint,, YIKES! This is the most beautiful space,, amazing!!! What a gorgeous house you have, love it. What can I say? It is stunning, it's you, it's magazine worthy. So glad you got it done before school starts and you are all ready to enjoy and use it. So fun to have a new space to use and one that looks so beautiful too! Your art studio looks fabulous! I LOVE the painting of the red rose. Your finished room looks functional and cozy. The armoire is so pretty. I really like the table your husband bought for you. It is very unique, and that's what it's all about. Oh my goodness Ricki...it's gorgeous! It looks too pretty to be a studio. I love it! Wow! Looks great! As does your dining room in the previous post. What fun all this is! It is so lovely my friend! I have told you many times that using white as base color and accentuating with colorful pices is something I really fall in love for. The chalk painted pieces provides a shabby and elegant look and so as your couch. And the lamp rocks! It's so unique. Congrats for a wonderful make over! Really beautiful studio. What a great space to inspire you. I guess I pictured you painting at an easel but I assume you work with it flat on the table? Love your painting, the lamp and that beautiful table. What a nice surprise. That was so much fun--waiting for you to unveil your room. What's next?? What a beautiful room, Ricki. You are so talented is so many ways. Sorry you were sick..hope you are back to a 110% now. :) It's too dern hot to be sick. So sorry you have been under the weather. Your art studio is amazing and I am so impressed at how elegant and lovely it is --- white settee and all! A room that is just as lovely to look at as it is functional. 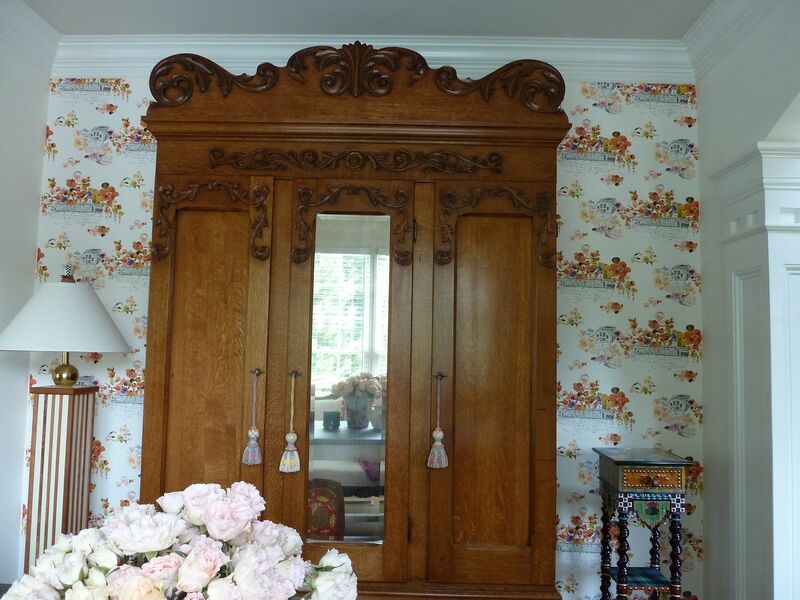 That armoire is fab! 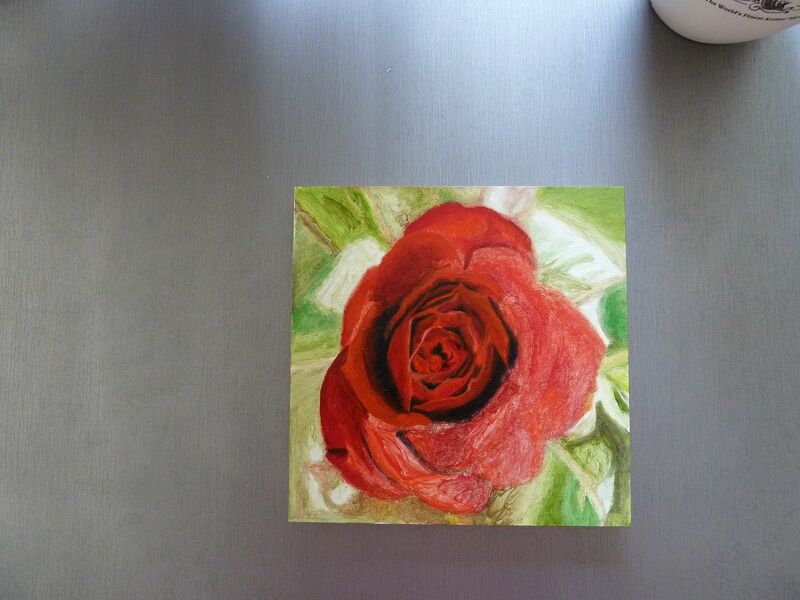 And last buy not least..... your rose painting is AMAZING! Oh how I wish I had your talent! Very Georgia O'Keefe. Loving every inch of it! Such a fun post. Thanks for sharing. Great work on the lamp and table selection by your hubby! Oh MY Goodness! 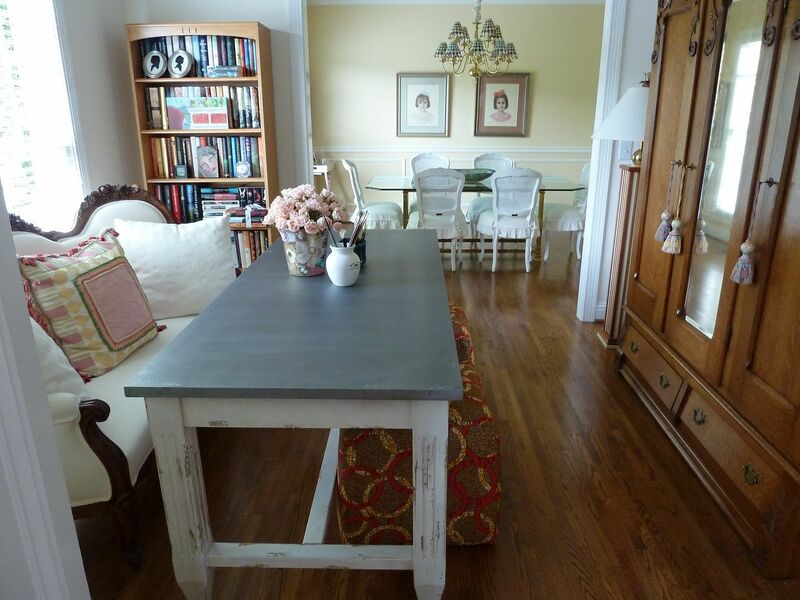 Your Dining Room and Studio are PERFECT! You do a great job of pulling together that eclectic look. I love the white/pale and then the pops of color. Very nice! I also love the wallpaper that you ended up choosing too. It just all looks so pretty. I'm glad your feeling better. I'm going to go read your latest book review. I am currently trying to finish A tale of 2 Cities. I'm struggling through it to say the least! OMG this room is gorgeous!!!!!!!!!!! I want your sette and dining room chairs too! I love your home...it's beautiful , homey, warm and fun!! It's beautiful, but where is the mess!!? You will have to some where in the future show use when you are in the middle of a project! What great storage to hide all of your treasures, and the Mr. is pretty darn handy! I love that lamp...okay I love everything! I want to see the space in use.. you know...artists at work! can we peek inside? :) Your husband is very talented to make such great lamps. It's magazine worthy for sure. I feel like it's a glamorous grown-up studio. And I love the Mr. Art pieces in the room. Art Studio?? It is nicer than my living room! I love the lamp and the room does not look little in the pictures. I love it so much! I feel more creative just looking at it! GORGEOUS!! omg Ricki...just breathtaking all of it! Ricki, this is spectacular. 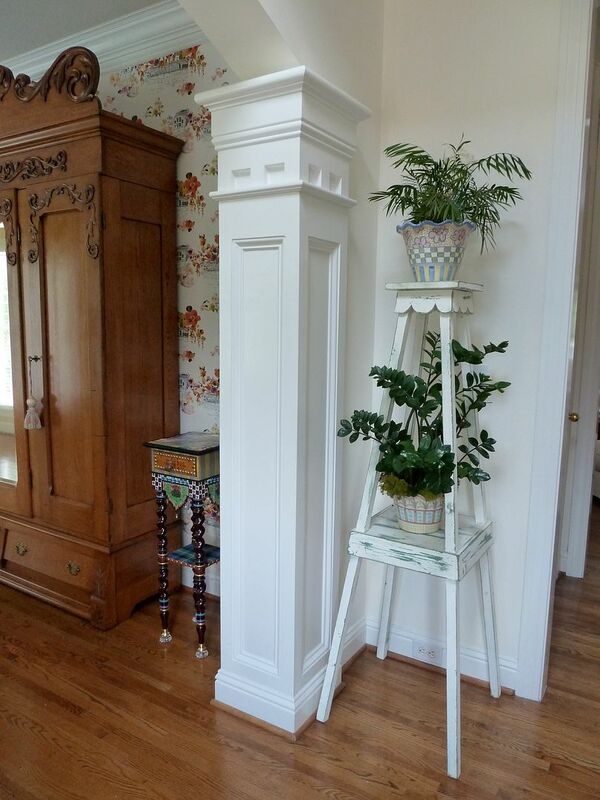 My mouth fell open when I saw that armoire. What a beauty!!! If you paint the hydrangea in the jar I would love to see it and possibly buy it. Ricki, I love it! 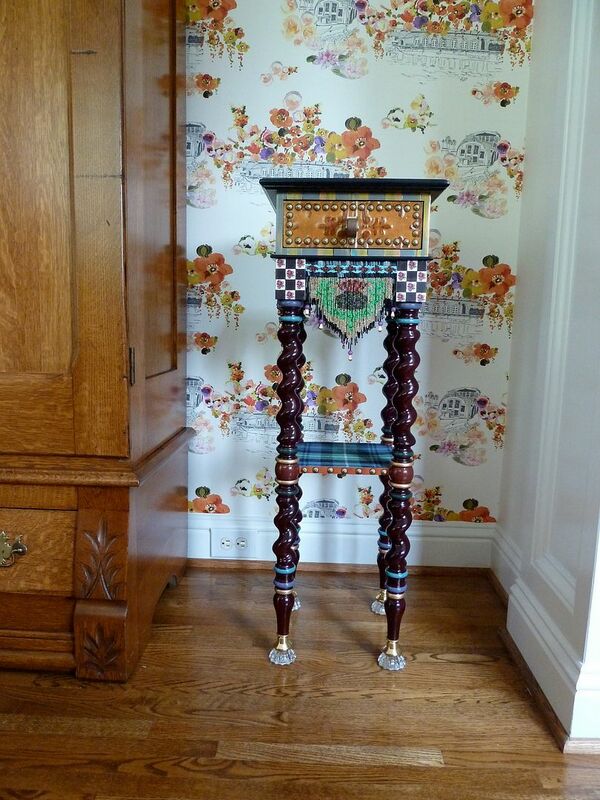 You have some really beautiful pieces and I love the wallpaper accent. 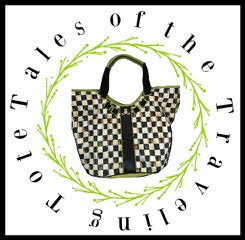 Thank you so much for the mention, I have had a few visitors from your post. Your studio is very unique and really does look like it belongs to an artist! It's also very attractive, I especially like your gorgeous couch. Your furnishings are to die for RJ. Seriously. I am in awe! So original, so unique, so one-of-a-kind, well you get the picture. Awesome! I featured you today at Mod Mix Monday! Serious talent here Ricki..I love love love your home, style, use of color, your unique flair, I can go on and on. I want to see more!